Need the accessories to go along with that new hammer? We have the tools for the job. Description: Our fine tool steel Pro-Claw™ Nail Pullers are Japanese pattern design, drop forged and tempered for extra durability. 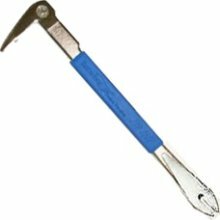 Both nail puller claws are precise and sharp to remove imbedded or headless nails with ease and will grab nail shanks to pull finishing nails through removed molding to minimize damage to molding. .. Description: Estwing's Lightweight I-Beam Construction Pry Bar has beveled nail slot. It's I-Beam construction gives added strength while removing weight. Rocking head provides maximum leverage. Features: Overall Length: 18" ..
Kodiak Notched Roofers SpadeSpecially Designed For Shingle RemovalHeavy-duty Fulcrum Welded To Back Of Blade-For LeverageForward-turned Step29" Seal-coated Hardwood Armor D-grip HandleBlade Has 6 Notches, 3/4" DeepLimited Lifetime WarrantyBlade:6-7/8 X 12"Handle:29" D-type Hdle..
Kodiak Notched Roofers SpadeSpecially Designed For Shingle RemovalHeavy-duty Fulcrum Welded To Back Of BladeForward-turned StepFiberglass HandleBlade Has 6 Notches, 3/4" DeepLimited Lifetime WarrantyBlade:6-7/8 X 12"Handle:48" Long Handle..